Project Overview: Students spend the week learning a variety of self-help skills as well as engaging in community field trips. Rationale: Children who are blind can benefit from direct instruction in a variety of self-help skills. They also need hands-on experiences to build complete concepts. Description: On the first day of camp, each student receives their own tote filled with personal hygiene products such as toothbrush & toothpaste, a hairbrush, and soap and a washcloth. Children are instructed in proper use of these materials, and each day of the camp begins with children brushing teeth, washing their faces, and brushing hair. While some children may already possess the skills to do these activities independently, this gives them the opportunity to practice the skills under supervision and to model them for other children who may need additional help. 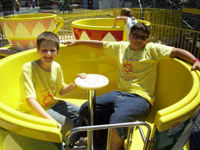 Over the years of conducting this day-camp, many different activities and trips have been offered. I will list several of them here, but understand that not all of these activities are done each year. Children visit a petting zoo where they can see animals up-close and touch many of them. A favorite activity is feeding the animals. They enjoy hearing the sounds the different animals make and also feeling the different textures of the animals’ hides. Campers cook their own lunch one day of the camp. The menu consists of grilled cheese, tomato soup, fruit salad, and brownies. 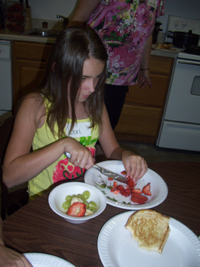 Each child works on their own individual sandwich and fruit salad. They take turns helping to prepare the soup and brownies. For the sandwiches the following procedure is used: Each child gets two slices of bread on a plate. With a butter knife they spread soft butter onto the bread. Spreading is a valuable skill that will be reinforced later in the week when they make peanut butter & jelly sandwiches for one of the field trips. Next they place their cheese between the bread and wait their turn to cook their sandwiches on the stove. With supervision, the students each fry their sandwiches. For the fruit salad, each child has a plate and butter knife for slicing and a bowl to put their sliced fruit into. Each student gets ½ a banana, a couple strawberries, blueberries, and a pineapple ring. Safe slicing techniques are taught and practiced as they slice the banana, strawberries, and pineapple. To make the soup and brownies, everyone is assigned a job. Some are in charge of using a can opener to open cans, others crack eggs or measure the various ingredients, while others still can be in charge of heating the soup on the stove (with supervision). Our local Pizza Hut offers a field trip for students that includes a tour of the kitchen and ends with each child making their own personal pan pizzas. The children choose what toppings they want to use and arrange them onto the pizza dough. When the pizzas are finished everyone enjoys a delicious lunch. This is a great opportunity to talk about what kinds of things they can expect when eating out at a restaurant including table manners, navigating inside the restaurant, and interacting with restaurant staff. The group talks about the kinds of things they need to bring on a picnic (food, napkins, a blanket to sit on, etc.). Then the children make their own lunches. They begin by making sandwiches, which includes learning how to spread condiments or peanut butter evenly onto their bread, selecting and placing other toppings onto their sandwich, and placing the sandwich into a baggie. They also select and wash fruit and decorate cupcakes to take along. At the park they enjoy lunch and some time at the playground. Children are oriented to the playground and taught how navigate the play equipment. They also enjoy some group games such as “Mother May I,” “Simon Says,” and “Red Light, Green Light.” This is a good way to teach them to follow rules and take turns. It also encourages social interaction. The park is contacted in advance to arrange our visit. An education guide meets our group and makes a presentation on local wildlife that includes sensory activities, such as listening to different bird calls and animal sounds, feeling different animal pelts, and tactually exploring real animals that have stuffed. Next the guide leads our group on a nature hike where the kids are encouraged to use all of their senses to explore. During the hike various animal sounds are pointed out to the children and they are shown native plants and encouraged to touch and smell them. This is a good time to teach the kids O&M skills that are appropriate for this setting. After the hike the children enjoy a cookout lunch at one of the shelters. The children are actively engaged in setting up and cleaning up after lunch. Following lunch, everyone changes into swim gear for an afternoon of swimming at the beach. Swimming at a beach provides many new experiences that pool swimming does not address, such as walking in sand, maintaining balance in the waves, and the various textures you may feel underfoot. A variety of artists such as sculptors, painters, textile artists, etc. can be invited to work with the kids. You can also plan and teach craft activities yourself. Children’s museums are wonderful places to encourage hands-on learning and concept development. The various activities offered by the Pittsburgh Children’s Museum, which we visit, are too many to list. When taking children to a museum it is important to do some research ahead of time to find out what kinds of exhibits are offered so that you can make adaptations as appropriate. It is also recommended that you visit the museum yourself first, to get a feel for the layout and anticipate any travel challenges. Often there are a variety of shows throughout the day. Again, you will want to be prepared to select the most appropriate shows for your group and work with the staff at the museum to adapt the activities as needed. When we visit museums, we usually pack sack lunches in the morning (teaching and reinforcing self-help skills) to be enjoyed in the museum’s picnic area later on. It is also a good idea whenever you plan to take a group of children to a larger attraction, such as a museum, to have matching shirts so that you can easily identify members of your group and keep them together. Putt-putt golf is an activity that can be easily adapted for children who are visually impaired. We take along a beeping device that fits right into the hole and shuts off when the ball lands on top of it. Any small beeping device that fits into the hole should work. Ideally, you can get a map of the course ahead of time and create a tactile drawing of each hole. The children can explore the drawing of each hole. When it is time to putt, each child walks the distance from where they are putting to the hole. Then we talk about how much force they should use when they hit the ball. After the child putts the ball, a guide walks them along the path their ball followed and then shows them where their ball is in relation to the hole. Orientation is reinforced throughout. Also, approximate distances should be continually verbalized and reinforced. Go Carts are a favorite activity of the children. There are two ways to go about this, and it is recommended that you try both with each child. One is to have the child control the gas/brake while a sighted guide steers. The other is for the guide to control the gas/brake while the child steers. Of course, with either option plenty of verbal description is needed! 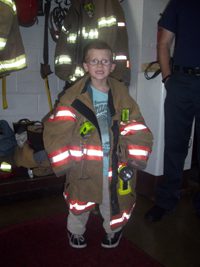 Many fire departments have children’s programs in place and are happy to have a group of children who are blind and visually impaired visit. The program we attend includes a short video on fire safety, goodie bags for all of the kids, and a visit to the garage to see the trucks and equipment. In the garage the children can try on various pieces of firefighting gear including jackets, boots, and helmets. They also learn about the different kids of trucks. For a child who has no usable vision, a good activity is to have them trail around the perimeter of a truck to get an idea of the size. Often, the children will also be allowed to sit in the seat of a truck. A guide from the greenhouse can show the children a variety of plants and flowers. 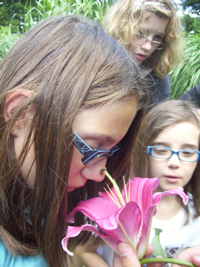 Touching and smelling the different plants provides a multi-sensory experience. Students with low vision can also benefit from observing and comparing the various colors and shapes. 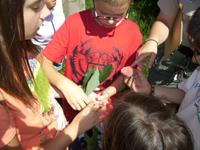 An excellent hands-on activity is for the children to pot their own plants. A potting table is set up with the tools they will need: gloves, spade, soil, empty pots, and flats of plants. The children partially fill their plots with soil. Using the spade they make a small opening in the soil for their plant. Gently removing the plant from the flat, they push it into the opening and fill dirt in around it. The children can plant several plants in their pots, learning about the different plants as they work. This is a great tactile experience for all of the children. This planting activity can be done right at the greenhouse or back at your camp facility. Result: Students gained self-confidence by learning and practicing new skills for independence throughout the week. They also developed a better understanding of many real-world concepts through a multitude of hands-on activities. Compensatory skills were reinforced as the students wrote thank you notes to the different places that hosted them during the week. Finally, students enjoyed social time with their peers while learning about cooperation, appropriate behavior in a variety of social situations, good manners, and problem solving with others. Brainstorm a list of ideas for field trips. As you focus your list, consider the goals that you hope to accomplish during the week. Make arrangements for the individual field trips, working with the sites to accommodate your students’ special needs. Plan a daily schedule that includes time for grooming. Review “Foundations of Rehabilitation Teaching” to learn about appropriate techniques for the independent living skills that will be addressed during the week.